Thailand and Temples is like The Netherlands and Windmills or like France and Wine. 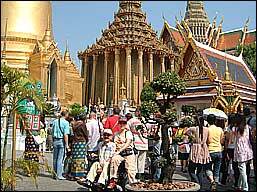 Especially the temples in Bangkok and the Grand Palace, is a must see. 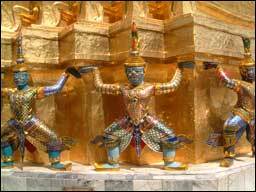 A description of Wat Phra Keaw (Emerald Buddha), fills every beautiful item of this Thai cultural heritage site. Only a personal visit can show you the beauty of the temples, temple grounds, pagodas and Buddha statues. Words and pictures are just not enough. A wheelchair accessible toilet is located near the entrance of the Palace. All temple grounds are wheelchair accessible. Buildings not always, but help for lifting is always available. Depending on the time you have the possibility to visit Wat Po (Golden reclining Buddha) and/or Wat Traimit. 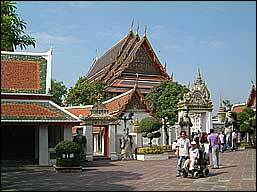 Wat Traimit (Golden Buddha) temple is the only accessible temple building in Bangkok. Lunch possibility in Riverside restaurant. Lunch is at own expense. Departure to Bangkok preferably at 7am. Departure Bangkok to Hua Hin 3pm at the latest. Price includes transfer, drinking water in the car, expressway fee, parking fee. Price excludes entrance fee, guide, meals, personal expenses, etc.